Pithecellobium dulce growing tree of the genus Pithecellobium also known as Sweet Inga or Monkeypod, Pithecellobium dulce perennial evergreen to semi-deciduous plant also used as ornamental plant and fixing nitrogen, can grow in tropic, mediterranean, subtropical climate and growing in hardiness zone 10+. 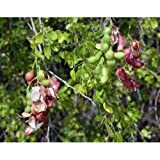 Pithecellobium dulce MANILLA TAMARIND TREE Seeds! What can be done with big quantities of Pithecellobium dulce fruits?